Kentucky lawns are among the most beautiful in the nation. Kentucky weeds are among the healthiest in the nation. The two most common weeds, crabgrass and dandelions, keep company with ground ivy, another vigorous weed plus thousands of broadleaf weeds. Getting rid of them requires a plan of attack and remaining vigilant come early spring. Crabgrass gets its name from the crab-like legs that extend from the main root. The annual weed grows vigorously in the heat of the summer, and one plant is capable of producing 150,000 seeds each season. In the winter, the seeds lie dormant waiting to sprout into invasive plants during the spring and summer. In the winter, it dies off leaving bare, uneven spots in the lawn. These bare spots are where the seeds will sprout the coming spring season so be prepared to treat the areas in early spring with a pre-emergent herbicide, sold at any home and garden center. Crabgrass does not like shade, therefore, the best weed eliminator for it is a dense, thriving lawn. The lawn should be mowed not more than 2 1/2 inches from the ground. Since crabgrass grows in a flat pattern, the grass will shade it from the intense sun on which it thrives. 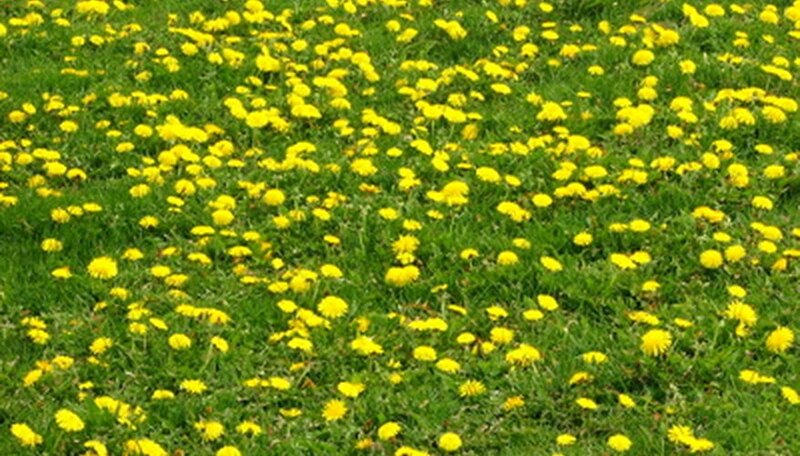 Dandelions, a broadleaf weed, can be identified by the round yellow flowers adorning it. Each seed head produces thousands of of seeds that float easily in a breeze. If your neighbors have a dandelion problem, it will also be your problem. Treat this weed during active growth with a spot treatment. Weed and feed fertilizer or granular forms of weed killer should be applied to wet grass and weeds. The weed control must stick to the plant to be effective. Spray weed killers should be applied on a non-windy day so as not to float onto other plants. Weed killers, other than weed and feed, will kill all plants. Ground Ivy, also known as Creeping Charlie, is among the most difficult weeds to control. The low growing perennial thrives in every growing condition, other than dry. As it grows, Ground Ivy roots at each joint that touches ground making it a vigorous grower. Almost impossible to control, pulling it has little affect because roots usually remain in the soil. It also spreads by seeds. To control Ground Ivy effectively, a combination of herbicides must be used. The fall, from early mid-September to November is the best time to control this weed using two herbicide combinations. To achieve good control, space these applications out by 28 days. Weed killing products with dicamba as an ingredient is necessary. These products also contain 2,4-D and MCPP. Repeat applications may be needed to control Ground Ivy.